Wow, sugar free kheer, thats seriously amazing. Love the addition of banana and dates to bring the sweetness to this healthy kheer. Delicious. Cracked wheat Payasam looks good, i too experiment with dates for payasam and really love the flavor it gives into the kheer. Great share, it's one healthy payasam for sure !! Harini , that’s a perfect recipe for the finale post . The Dalia kheer sounds delicious and making it sugar free is such a healthy option . I have never addedbanana to the kheer , but mangoes yes ! Infact I make the Dalia kheer with mangoes . You have given us a treasure box of healthy and interesting recipes all through this marathon , kudos on the efforts . Great idea to replace the sugar with fruits like banana and dates. This is sure a guilt-free kheer for any occasion. Few years ago I used to make dalia almost everyday and we would all have it in breakfast. Adding dates and nuts would make it more healthy and tasty. Love your sugar free version kheer and I want to grab a bowl from the screen. That's a delicious kheer and a great way to end this series. 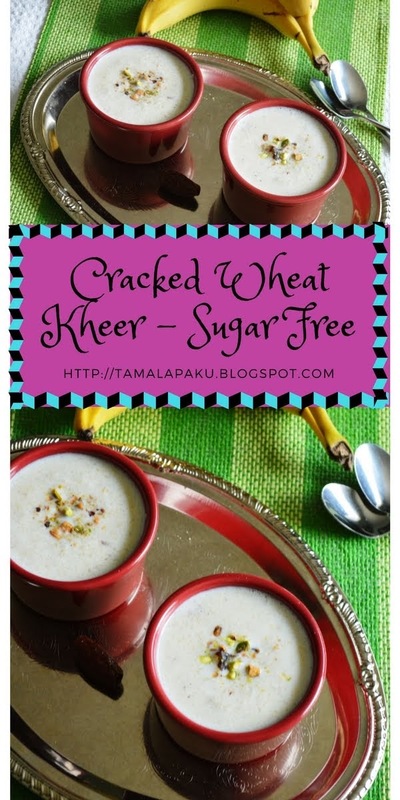 Sugarfree kheer is healthy and interesting recipe for health conscious ppl. Wow, such a nutritious and delicious kheer with cracked wheat. Adding mashed banana and dates sounds just the right way to sweeten it. Looks so creamy and delicious. Such a delicious and yummy looking kheer i love to use dhalia is some forms in our food and this kheer is really interesting and im making them soon..
That is an awesome dessert for the final day Harini. Love the sugar free recipe and it is such a delicious healthy treat. enjoyed your whole series very much..
Hubby has been asking for some dessert and this one is perfect, sugar free. Making kheer with broken wheat is new to me. This is a fantastic one to end this series Harini. Enjoyed your theme based marathon, each one so carefully picked! wow kheer looks so creamy and such a delicious way to add cracked wheat in a payasam :) looks so yummm !! Enjoyed all your recipes throughout the marathon !! I love cracked wheat payasam and love how creamy yours look. Love the no sugar added version and this definitely makes it a lot healthier. It was so much fun to read your posts with 4 different themes all through the month. I never add fruit puree to the cracked wheat kheer but this sounds like one more way to get my lil one ot eat fruits!This is surely a delicious way to end the marathon Harini! wow harini, superb way to end the marathon, love the date-banana added as sweetner here! would love to try this fruity kheer!